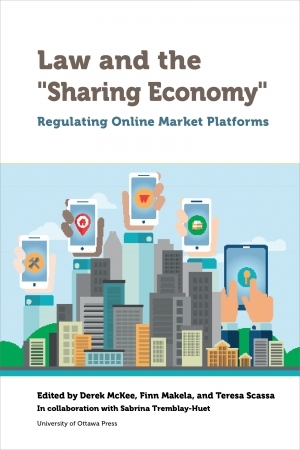 New Open Access Book on Law and the "Sharing Economy"
Law and the “Sharing Economy”: Regulating Online Market Platforms is a new, peer-reviewed collection of papers co-edited by Derek McKee, Finn Makela and myself. The book is the product of a workshop held in January 2017. It is published in late November 2018 by the University of Ottawa press in both print and open access PDF formats. The title of the book uses scare quotes around ‘Sharing Economy’ because of the deep ambivalence felt about the term amongst contributors to the volume, and the inability to find a suitable alternative. The term ‘sharing economy’ is used by some to suggest an alternative to the market; others have used it to describe activities taking place over large, commercial platforms. And, while some of the platforms use the rhetoric of helping ordinary individuals make ends meet by providing them with the ability to commercialize (‘share’) underutilized resources, the reality is that many of the large platform companies have resulted in other resources finding their way into the ‘sharing economy’. These resources may include, for example, living spaces once rented out on a long term basis that now turn greater profits as short term accommodation. Platform companies have had broad disruptive impacts. Our authors consider their impacts on licensing regimes, alternative dispute resolution, legal normativity, local governance, specific industries, and labour rights. The also consider platform companies’ digital data, their relationship to international trade agreements, and the competition law and policy issues they raise. The collection of papers in this book offer “a set of diverse lenses through which we can examine both the sharing economy and its broader social impacts, and from which certain key themes emerge” (introduction, p. 5). The book is organized into 5 broad themes: Technologies of Regulation; Regulating Technology; The Space of Regulation – Local to Global; Regulating Markets; and Regulating Labour. The papers reflect a diversity of perspectives. Some explore issues in the context of specific platforms such as Airbnb or Uber; others consider the issues raised by the ‘sharing economy’ more broadly. A Table of Contents for the book is found below. Derek McKee, Finn Makela, Teresa Scassa, eds. Should Licence Plate Owners be Compensated when Uber Comes to Town? Making Sense of the Public Discourse on Airbnb and Labour: What About Labour Rights?